Iranian officials express satisfaction over the resignation of US Ambassador to the UN, say her statements caused the isolation of the US. Iran on Tuesday expressed satisfaction over the resignation of US Ambassador to the UN, Nikki Haley. "’New Sheriff in town’ is no longer,” tweeted Alireza Miryousefi, head of the press office at the Iranian Mission to the United Nations, in a reference to Haley’s remarks at the AIPAC Policy Conference in 2017. “We do not know who she was or what she was about, but she was a serious problem at the UN with her uninformed statements and her causing the isolation of U.S. You need to know: there is no new sheriff in town,” he added. Iran’s envoy to the UN, Gholamali Khoshroo, also commented on Haley’s resignation, claiming that the United States’ unilateral policies on legal, international and environmental issues and the country's withdrawal from the international agreements, including the Iranian nuclear deal, has increased its isolation in the world. According to the IRNA news agency, Khoshroo further claimed that the United States’ unilateralism during Haley's tenure led to the US' isolation in the UN. Despite Haley’s efforts in the UN, the Palestinian issue is still a top priority, he added. She was also a vocal critic of Iran, having recently warned of the danger the Iranian regime presents to the Middle East. "The Iranian regime has backed dictators who gas their own people. It stokes conflict. It funds foreign fighters and terrorists. It transfers missiles to militants. 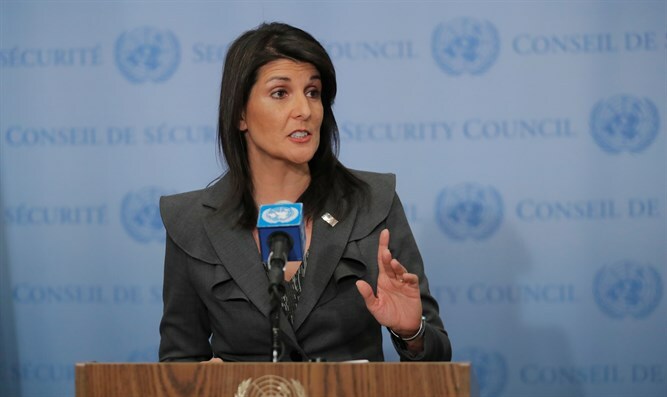 It acts against the interests and policies of this Security Council, time and time again," she said during a meeting of the Security Council on the subject of the Middle East.